When: Last Thursday. Location: Starbucks Coffee Shop. What: Story material. Lots of it. If you have spent any time in my company or on my blog, you’ll appreciate how much I love meeting strangers. When I walked into the coffee shop last week for a late-night study sesh, I had no idea what the next four hours had in store for me. Here’s a spoiler: It’s not a romance story. It’s something much better than that, believe it or not. It’s a story of humanity. The funny part–and my personal favorite part–of the encounter was that it had two outcomes placed literally on either side of me: one directly to my right, the other to my left. The left seat at the counter was empty when I sat down, and I barely glanced at the guy sitting next to me on the right as I unloaded my books. He was immersed in his phone, checking the web while his book (probably a theory text) lay open, ignored, in front of him. At one point over the next hour, I asked him to watch my things while I went to the bathroom; about 30 minutes later, he asked me the same favor while he went to order a coffee and half a banana (I didn’t know until then that you could even buy bananas in halves at coffee shops). I said thank you. He said thank you back. He didn’t seem like much of a talker. It was a random question, and no–he didn’t have any makeup on. Now that he asked, of course, I was more than a little intrigued, so I waited for an explanation, wondering vaguely whether he had had a bad accident in the middle of Sephora and managed to face-plant smack dab into the eyeshadow and blushes display. As it turned out, it had been his first week on the job as a graphic designer for a startup and the company had taken him out for a little “gettogether”–a drinks and hazing session. Part of the ritual was doing embarrassing things in front of strangers, which included walking into a beauty parlor and asking to get his makeup done. Apparently it wasn’t a half-bad experience. Having stepped into a parlor a grand total of zero times in my life, I took his word for it, and I told him so. We actually ended up chatting for a good ten minutes, Marv and me. He told me about his background–the workplace woes of a graphic designer–the frustrations and little perks of unpaid internships. After a while, we both decided we needed to do what we had come here to do–namely, work–so we turned back to our laptops. Barely 3 minutes went by before pair of his friends spotted him from the outside window and came in, making a pretty substantial din of conversation and leaving me to my own devices. For the next ten minutes, I half-listen to their buzz as I slough through some more of Lewis Carroll’s thick, juicy biography. The part that gets me is that, standing here writing about the moment now, it took me a while just to remember why we started talking in the first place. He had asked me what time the cafe closed, and I confessed I had no idea–but would he be asking? Because if he was, it would be great to know. He got up, went to the counter, came back, and reported a 2 AM closing time. “Perfect,” we both said at the same time, before breaking into matching, hesitant grins. And then suddenly we were chatting like a pair of old neighbors who had once had to join forces to battle feral cats in our shared backyard but hadn’t seen each other since then. It wasn’t creepy intimate talk, but it wasn’t just small talk, either. It was just–talk. The real bonding point in the conversation occurred when I was telling him about one of my former students. The topic was “never making assumptions about other people”–something that I valued not only in everyday life, but in particular as a teacher. This student had returned to school in her late 30s: she was working a full-time job running her own business 60 hours a week, on top of which she was a full-time student struggling to finish her degree. She hadn’t been doing so well in my class, so we had met outside school hours on several occasions to discuss her life. On the date of our last meeting, she told me that she had caught the flu–that her 1-year old daughter was home sick with a fever–and that she couldn’t afford a C in the class. It took us a while, but in the end I convinced her that it’s okay to make priorities when life steps in…as it is wont to do. She wasn’t completely satisfied, but she did seem reassured. He showed me a photo of his teething 10-month old daughter, who was home, as it was, sick. Her mom was taking care of her, and he was stuck at the campus coffee shop late into the evening because traffic had been so bad with the rain. What was more, he was a full-time assistant manager who was coming back to school to earn the degree that circumstances had forced him to pass over when he was 18. Now, nineteen years later, he needed that degree to be promoted and move, hopefully, into the company’s philanthropy department. The conversation lasted for another 2.5 hours, with this “rando” (as my friend would say) whom I thought would pass in and out of my evening without a second word. We talked about appreciating our lives as students, grappling with life’s curve balls, making the most out of very little. It wasn’t even until the final half hour of our conversation that we got each other’s names. On the other hand, the friendly guy on my left tapped me on the shoulder to say goodbye before he left, and that was the last I saw of him, too. It’s strange how life sets up and thwarts every expectation you might form. Around 11:30, I packed up to leave and visit a friend, and he figured he could probably head home as well. There was nothing more than a smile and a “best of luck” to each other as he got into his car and I walked in the opposite direction, but somehow that uneventful goodbye seemed much more meaningful than any drawn-out, cinematic parting. It confirmed my longstanding suspicion that life might be more than an affected Hollywood film; that unexpected encounters can come in the most unlikely guises; and that sometimes recognizing that not everything must come full circle is the greatest mark of humanity’s tiny miracles. Most important, I don’t believe either of us will be in a hurry to forget it, either. 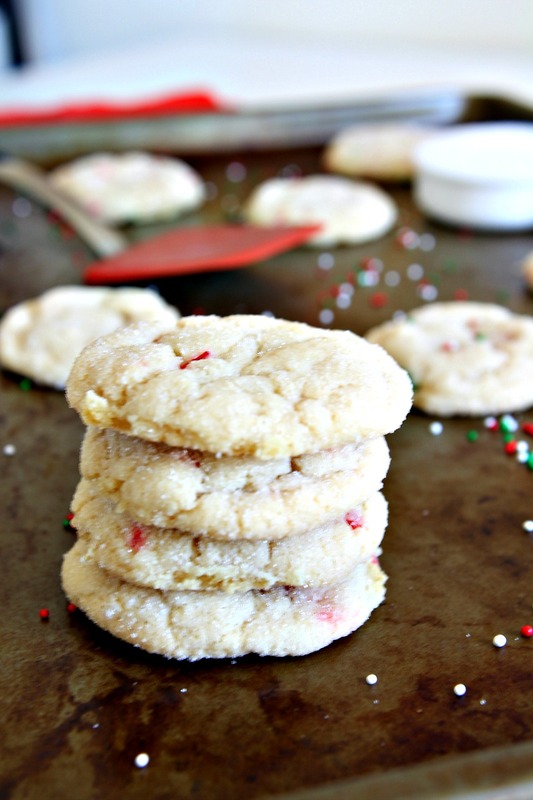 Call me crazy or just a delusional food blogger, but as I was sifting through my food photos for today and wondering what baked treat I should pair with this story, something about these Funfetti Sugar Cookies immediately called out to me. 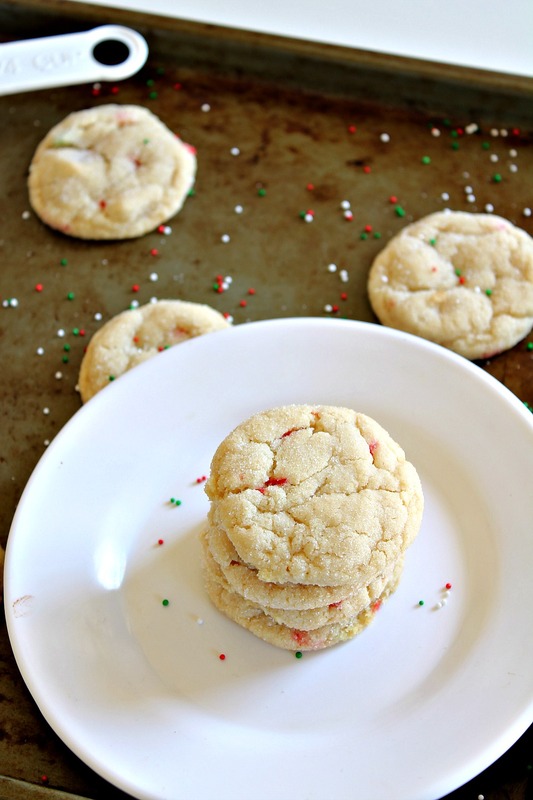 Wonderful as these chewy-middled, crispy-edged sugar cookies are on their own, there’s nothing a smattering of colorful sprinkles won’t do to brighten them up. Wishing you all a bright day filled with unexpected, colorful encounters and bright highlights! In a large mixing bowl, cream together butter and sugar until light and fluffy. Beat in mayo (or 1/2 egg) and vanilla. Sift together dry ingredients (flour, baking soda, baking powder) and gently mix into wet ingredients until just incorporated. Add and fold in sprinkles. Fill a small separate bowl with about 1/2 cup white sugar to start, adding more as needed. Using a spoon, scoop out one tablespoon of dough.and roll it in white sugar until completely coated. 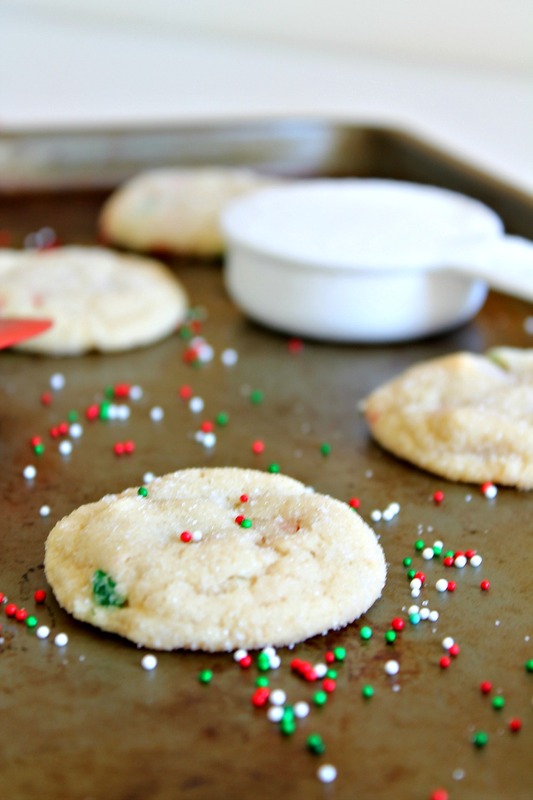 Place on prepared cookie sheet and repeat with remaining dough, placing cookies 2 inches apart. Bake in preheated oven for 9-11 minutes, until the edges have set and the middle is still slightly undercooked--the bottoms should be a light golden brown. Remove sheet from oven and place on stovetop to cool completely; the cookies will continue to cook during this step, so don't skip it! 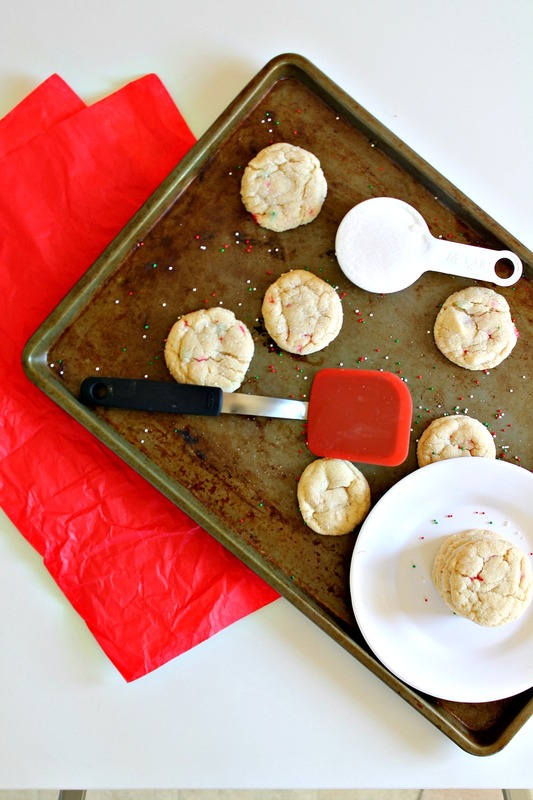 Eat immediately and store remaining cookies in an airtight container for up to one week. You’re super friendly, girl. 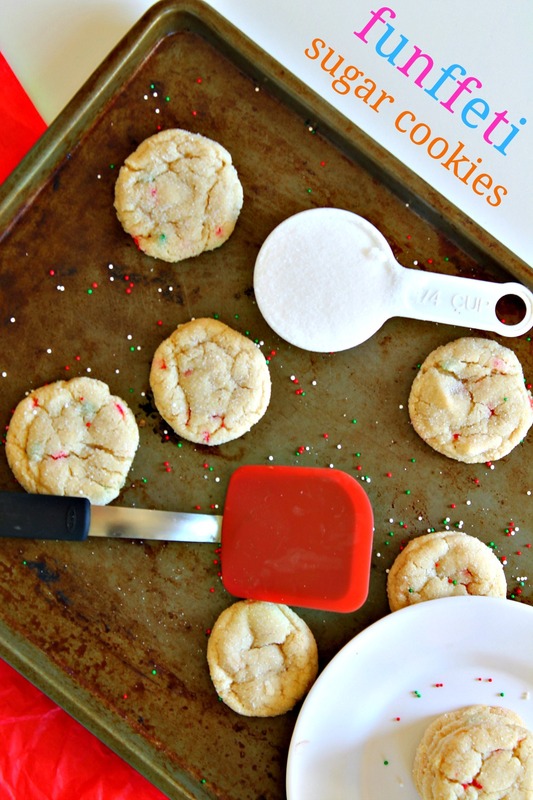 And these funfetti cookies bring smile, a big one. I rarely meet stranger in my workplace, but one of the guys int he same building is so friendly. Seems like he know everyone from random talk in the elevator. Aw, I love token friendly people like your work guy! They brighten up my day so much 🙂 it’s amazing what a long way a smile can go. You must be lovely to chat with yourself, Linda–we’ll have to chat soon! I love evenings like that one–most definitely interesting! Thanks so much, John. Wishing you a stellar weekend! And talking with strangers truly is the best. You learn from them, and there is no judgement on either side so you can be as free as you want – thanks for sharing your story! Daw, I bet you’re GREAT at chatting with strangers, Uru! I just can’t imagine your lively writing being anything other than a way for you to channel your bright, lovely personality. Have an awesome weekend!! I LOVE all the back story behind these cookies!! I’m a big fan of people watching, especially at coffee shops, but I think you took it to a whole new level. 😛 In a good way. People watching is the BEST. That’s half of the reason I love going to Starbucks and sitting at the window seat….oops, did that just sound ultimately creeper status? Ala, I love how open you are to new experiences, meeting people and just welcoming positive vibes from the universe. I’m pretty friendly and I love small chat with strangers but I probably couldn’t engage in hours-long convos with randos at the neighbourhood Starbucks. And look what I would have missed! Thanks for sharing this experience with us. And a huge thanks for these delicious cookies – funfetti makes everything better! Heyyy lady! I’m so glad you’re back and around–I saw your post and still have to catch up. I still have my longstanding penchant for chatting with randos, so I’m sure next time you check back, I’ll have another fun encounter to share 😉 hope all is well!! How have I never eaten funfetti? 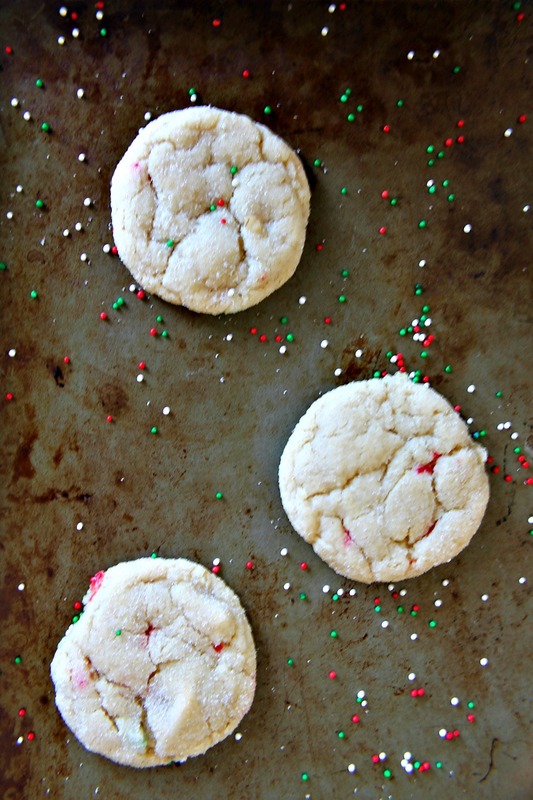 These look so cute and delicious, Ala! Love the sprinkles!